This one’s for the teachers. Within the last few years, we’ve been stretched quite thin when it comes to budgetary matters, and very few sectors of our economy have witnessed as dramatic a cut in services as our schools. With this in mind, I’ve made the decision to put my greediness aside, and offer some help instead. 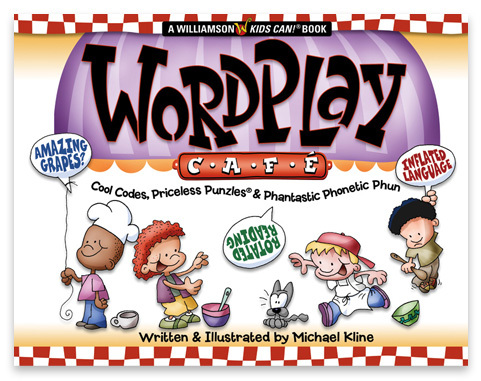 In 2004, I wrote and illustrated WordPlay Café (Williamson Publishing). 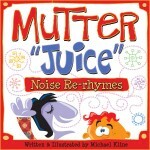 It’s a fun and educational romp through the more common aspects of linguistics for kids, and was driven by my desire to not only present the humor in wordplay, but also explain how it works, so that kids may begin to build their own unique brand of phonetic fun. Below you will find links to the book as chapter-by-chapter PDF files. Some chapters are as large as 5MB, so allow some time to download (right click or control click), especially if the site is busy. (Front Matter & Chapter 1, and Chapters 5 & 6 are combined into one file.) Viewing will require the use of the Adobe Reader, which is available at their website for no charge. Be sure to have your students read through the front matter first, as it explains how the book works. All I ask in return is that the files remain in the classroom and be treated in a scholarly manner. In addition, I would appreciate any feedback on the book and would ask that any purchase or review of the book go through amazon.com. Should you assemble classroom activities around a particular page or idea, I’d love to share it on the website with other teachers. Be sure to pass this link to other educators as well. A Parent’s Choice® award winner. Join me on Facebook or Pinterest! And if you have extra moment, check out my blogs on the Kids Discover website for more unusual insights for parents and teachers. Hi Neita, Thanks for the nice comments. 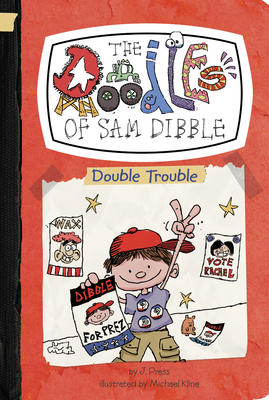 I loved writing the book (and illustrating it). If you will forward a physical address to mikey@dogfoose.com, I’ll send a live version of the book to you and your students (if you don’t have one already). Thanks again! Be sure to Pin it on Pinterest (along with your comments if possible) as well. Thank you! Just what I was looking for! You did a great job, such a fun way of presenting the material! Thank you so much! What a wonderful resource for our classroom – and I cannot tell you how much I appreciate the free download! I am looking forward to developing some lessons for my classroom! The book is for sale at amazon.com. Translating it might be a problem (I’ve actually thought about it already). There are many Americanisms and puns that play off the English language, so a lot of the humor and lessons might be lost. You are welcome to try though. Thanks for the note. Wow! Thank you SO much!! This is really fun and will be a fantastic resource for us!! I look forward to using it with my students! I am a Mentor teacher in Maryland. I am doing a professional development that centers around Word Work and your book. Thank you! Your book is simply amazing. I cannot wait to share all of your wonderful ideas with the teachers! Thanks Deb. I’d love to know what your teachers think of the book as well. Thank you for the wonderful book! Can’t wait to use it with my students. I love the illustrations! This is a great resource. I am starting a new job in a high school with special needs students and I think this will be a very useful resource. Found you on Pinterest and so many thanks to you for your generous help. I have taught for 35 years now and still work to improve on what I can offer my 3rd graders. I can not wait for school to start and use your information, kidding about the school starting but you know what I mean:) Thanks again! I can not say thank you enough! I am a full time college student enrolled in the Elementary Education program. I am in a class called intermediate reading, and needed this book, but could not locate a copy I wanted to keep for my future classroom. I will be using this every day in so many ways this semester. I will be doing some mentor work as part of my class, this book will be an asset to my life and career! With material like this I know the students will love to learn more! Hey mike?? ?is this geared toward a certain age group? I would hate to send the link to teacher friends who may not be able to use it for their age group. thanks for sharing. hope you and your lovely wife are doing well. Hi Cyndi, the age group for WordPlay Cafe is 8-12, though teachers of younger students are using it as well. I just found your site as I was attempting to find resources to use with science teachers k-12. I have been a secondary science teacher for almost 14 years. At the beginning of the year, I was offered a job to help teachers. During all my years of teaching, I had been very fortunate to have had great mentor teachers and felt that I could give back by taking this job. Now, I am working on learning the material for the levels I have not taught and trying to find ways to present the materials to the teachers or provide them with resources for them to use with their students. I found your science cartoons fabulous! They did a beautiful job illustrating the concepts in some of the science topics my educators are expected to teach. I was wondering if I could use a couple of your science diagrams in either different science presentations of in handouts to teachers sharing different sights and resources available to them. I appreciate your time and attention. Thanks for the free download! I came across your book through a colleague on eslprintables.com. I am an Italian teacher of English to middle school students in Italy. I am looking forward to reading your recipes and trying some to make my students understand that learning a foreign language can be fun and creative. Thank you! Thank you very much for sharing this with teachers!